Image originally from Atlanta Journal-Constitution, found at New Georgia Encyclopedia. Join us on Friday, December 20th at 6 p.m. as Gary Carden offers up Appalachian Christmas tales at City Lights Bookstore. Carden will talk about old rituals still practiced and some of his own childhood memories of Christmas in the mountains, including some of the leaner years during WWII when rationing was at its peak. He will also talk about some of the stories featured in Eliot Wiggington’s Foxfire Christmas. 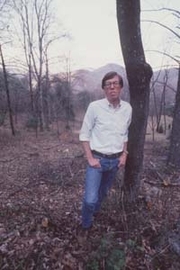 Gary Carden is an award-winning Appalachian author, playwright and folklorist. He has written several books, including the recent Appalachian Bestiary which details some of the creatures featured in Appalachian lore. For more information or to reserve any of Carden’s books please call City Lights Bookstore at 828-586-9499. Eliot Wigginton is currently considered a "single author." If one or more works are by a distinct, homonymous authors, go ahead and split the author. Eliot Wigginton is composed of 17 names. You can examine and separate out names.